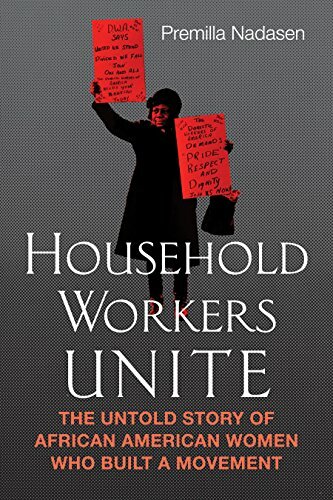 Household Workers Unite is an important book on an important topic; it is a history of the labor conditions under which black household employees (i.e. maids) in the United States worked, and their efforts to improve their working lives, especially during the 1950s through 1970s. Ms. Nadasen points out that these women were excluded from the labor unions and not covered by many of the labor laws improving the conditions of male workers. Housework was considered to be in the women’s sphere, and was not valued even when housewives were doing the work. The subtitle of the book is “The Untold Story of African American Women who Built a Movement,” and Ms. Nadasen does her best writing when telling the stories of individual women or well-known events such as the Montgomery bus strike. However, too often she writes in generalities, and often repeats information already conveyed, possibly in a different context. Moreover, Ms. Nadasen sometimes writes long, unclear sentences. An example is: “Southern congressmen, insisting on control over the African American labor force, policymakers, and labor leaders, who prioritized the needs of the white male industrial worker, advocated circumscribed coverage of work-related benefits (p. 126).” This style of writing makes me wonder whether the book is based on a doctoral dissertation; I did not find any evidence that it is. Both individual women leaders and organizations are discussed in various sections of the book. A glossary giving brief information about these women and organizations, including what the acronyms stand for, would have been useful. Although the acronyms are identified the first time they are used, many are unfamiliar to the average reader and are often used later in the text. Many the acronyms and spelled out forms appear in the index. Although much of the writing is pedestrian, the book can be very interesting when information which relates to one’s life story is told. I personally was struck with the description of the working conditions of many household workers. Often white employers would make the worker come in the back door, eat in the kitchen, use a separate toilet, and receive some of her “pay” in leftovers, etc. I remember the bedroom with a sink and toilet alcove over the kitchen in my grandmother’s house; her weekly black maid used those facilities, and occasionally took food home; I certainly hope it was not in lieu of pay. In my opinion, the most interesting part of the book is the epilogue in which Ms. Nadasen relates her own family’s story and why she wrote the book. Aspersions about “revisionist history” are oft leveled at well-considered and needed critiques of the dominant historical narrative, which borders on hagiography, that silences the majority of those who lived in favor of deifying the few rich, powerful, and often male individuals who reaped the benefit of those who labored. For analogy, history of generals that ignore the contributions of the soldiers who fought. These complaints about revisionism have little, if not no, merit and are lodged as ideological attacks attempting to keep minority voices silent, keep minority identities in the category of Other, and keep minority individuals from claiming any part in the dominant identity. In terms of the United States, the claims of revisionism are an attempt to keep the American Identity one that is essentially grounded, with particular racial emphasis. With the counter-revolutionary side in mind, the genre, for lack of a more appropriate term, for this type of reclaimist history, is most famously represented by Howard Zinn’s People’s History of the United States. While these histories tend towards a focus on labor and its contributions, there are many that recognize the intersection of class, race, and gender in their attempts to tell the history of Others to the dominant narrative. Premilla Nadasen’s Household Workers Unite: The Untold Story of African American Women Who Built a Movement is not only a solid addition to this genre, but seeks to elucidate this history, not through her own retelling of events, but rather to put the actors themselves in the position to speak. The result is not only a well-told history of household technicians, but a primer for how those who have been, and still are, excluded from even definitions of what counts as “labor” on how to organize. This book seeks to counteract the pop cultural trope that black domestic workers (maids) are passive and loving mammies (see The Help, Gone with the Wind, etc) Domestic workers acted as the backbone to the Montgomery Bus Boycott and other civil rights projects. Without the support of black domestics, who made up the bulk of bus riders, the boycott would have been dead on arrival. These women also participated in a positive way by cooking and selling food to raise money for the boycott. One of the domestics profiled in the book provided a safe place (and safe food) for Martin Luther King during the boycott. Their participation in the civil rights movement gave these black women the organizing experience and confidence to agitate for better working conditions. Before they began to organize, the jobs of black domestics were hellish (not that they get treated like Silicon valley CEOs now). Women were picked up at “slave markets” downtown, physically examined, partially paid in leftovers and hand-me-downs, paid starvation wages, and in general treated as less than human. Organizing workers is always an uphill battle, but organizing domestic workers was like climbing a sheer mountain face. They’ve all got different employers, they all work in different locations, and after scrubbing the floor on their hands and knees they don’t necessarily have the energy to organize and attend a meeting. In addition to this, domestic workers have traditionally been ignored by the established industrial unions. The author details the various groups these women formed. The domestics developed model contracts, training programs, and petitioned legislatures for the extension of workplace protections. Household work had not been legally been considered work. As a result, domestic workers were not subject to the minimum wage or workplace safety laws. The author’s major of theme of this book is the importance of storytelling to these women. Getting together to vent their frustration about how cheap Mrs. Smith is instills a sense of solidarity in these women. Additionally, when maids have to discuss how awful their jobs are in public hearings, it gains them sympathy for their cause of better work conditions. These brave African American women were able to score some victories. The minimum wage was extended to domestic workers (some of them anyway) and they do have some basic workplace protections. The fact that they were able to organize and achieve anything in the face of many obstacles is really impressive. Using the services of household workers is a long tradition in America. In the early days, there were slaves in the South and servants in the North who cleaned, cooked, did laundry, shopped, took care of the babies, children, ill, and elderly, and prepared for guests. After the slavery was ended, many families could not afford to hire all those people so the each of the remaining staff had to perform several duties.. The situation changed greatly after Dr. Benjamin Spock published his best-selling book about baby and child care. In it, he stressed the need for mothers to be more involved with nurturing and bonding with their children. The household worker’s position within the family changed as the children’s relationship with them lessened. As the women’s movement advanced and more women went to work outside the home, household workers responsibilities changed again. As more white women moved into the workforce, the need for household workers increased. The purpose of welfare changed, as well. Originally, in the 1930s, it was an important source for single mothers. White society began see welfare as a social ill and decided that women of color should be working rather than staying home since more jobs were available. More recently, the employers wanted less personal involvement. Training centers were established to help the workers learn new skills. One thing remained constant: The workers, usually black women, continued to be overworked, underpaid, and taken for granted. They often put in long hours but were not paid for overtime. They had to leave their own children and household tasks to maintain their employment. They received no benefits–minimum wages, vacation or sick days, overtime, Social Security, Workmen’s Compensation, health insurance–and could be fired at whim, for example, when they got old, without any severance pay. While many of their employers considered the women to be “one of the family,” the member they most resembled was Cinderella. Often they had to enter through the back door, use a separate bathroom, could not eat what or where the family ate, and certainly were not among the people with whom the employers socialized. The household workers were often given leftover food and no longer wearable clothing. They rarely received raises and had little chance for advancement. Some of the major reasons this situation existed was that the women worked in isolated locations and were fearful of being fired since they needed the income to support themselves and their families. But eventually some black women realized that there was a way to reach all these women: Public places like on the buses they rode to and from work. Using information gathered from talking with the women involved, Premilla Nadasen wrote HOUSEHOLD WORKERS UNITE to tell the stories of these women and the efforts to improve their lives through unionizing. The one thing most of the women wanted most was respect. Their employees might brag among themselves about how well the women served their needs, but would talk around them as if they weren’t even there. Many workers preferred doing household work and thought it was better than working in factories. Since housework was not recognized as real work, the household workers were excluded from key labor laws. As white women began working outside the home and immigration from Europe was curtailed, the number of black domestic workers rose from 28% in 1900 to 60% in 1950. In 1924, the United Daughters of the Confederacy launched a campaign to erect a federally funded “black mammy” monument in Washington DC. The bill passed in the House of Representatives but died in the Senate.” It was opposed by African American activists becuse they believed it glorified slavery and black subservience. When the activists worked to improve the conditions for household workers, they included women of all races and national origin. Soon, however, most of the non-black women dropped out. One major event that brought the situation of household workers to the forefront was the Montgomery Bus Boycott. At the start, more than half the black women workers in Montgomery were employed in white homes and relied on public transportation. Their labor was indispensable to the white community, many of whose members blamed the boycott on outside agitators. The didn’t believe their black household workers would participate in such an activity on their own. But the boycott created an opening for workers to express their political views and question the terms of their employment. Their employment in the homes of white people gave the black household workers intimate knowledge of what was being said and done in those houses as well as access to the people in power. Often the family members and their friends would discuss things without even realizing their conversations were being overheard: The household workers were indivisible to them. At the same time, some of them, especially those more actively involve, were closely monitored. They could not talk to each other. Their telephone usage was restricted. Intercom systems were used to spy. And they were fired without pay. The book focuses on activism from 1950s through 1970s and is arranged on the basis of the people who led the movement and the organizations they established. There is some overlap because of that and at times the names of the numerous organizations became difficult to remember. A listing, separate from the notes and index, would have proved helpful. I recognized the names of several of the leaders, some of whom worked in my own city. I was going to list them but decided that while the leaders were extremely important, it was the household workers themselves who took the risks which enabled them to achieve as much as they did. The struggle continues. HOUSEHOLD WORKERS UNITE was an eyeopener about what life was like for the workers and how working together, through organization, can bring about necessary change. It might be the only thing that can. It was a scholarly read, heavily noted, and quite detailed. I echo the review that this is an important book about an important topic, adding that it an often overlooked subject. This was an informative primer on the topic and gave enlightening biographies about the individuals struggling to make the changes. As it is a topic we hear little about and know even less about, the writing made the reader feel as though they were missing out on important information. Information, granted, we should probably already know but sadly do not. It was also a bit confusing as the timelines kept overlapping with the different chapters, as the writer focused on the different organizations, regions and/or movements. As the subtitle recognizes this as being an "untold story," I would have been great if the author taught us a little more about the story, rather than just the individual struggles that folded in the whole. Insightful history about the movement by black women for dignity, better wages and working conditions between 1950-1970 when they refused to be sacrificial “mammies” and demand respect and rights as workers. Black women had worked in the homes of white women during slavery. When they were freed, domestic service was often the only option for black women in the south where most lived. Often however, they were forced to continue in conditions much like those of house slaves. This pattern continued as black women servants moved north. They worked alone, under the control of the wife-mother of the household who defined their tasks and pay. Usually they did the “women’s work” of cleaning, cooking and nurturing that white employers did not want to do themselves. Joining together after World War II, black women affirmed a new sense of identity. They emphatically rejected the role of Mammy. Speaking out, they affirmed that domestic work was really work, not something that women, white or black, did out of limitless love. They attack the myth that they really were “one of the family,” a comfortable myth that enabled their employers to demand work without reasonable respect or pay. Sharing personal stories helped them establish their own dignity and respect for the work they did. Despite tensions with white feminists, both groups worked to shape a new understanding that a domestic worker was valuable and needed to be treated as such. A little-known sprinkling of black women domestics had tried to fight for rights before World War II. When labor unions won gains for industrial workers under the New Deal, however, domestic servants did not share in their victories. Union organizers often defined workers as white men in factories, and although some women workers’ issues were later included, domestic work was assumed to be impossible to organize. Black women domestic servants had to create new ways to organize. Sharing stories became a major part of their efforts. Because the households in which the women worked were geographically scattered, organizers recruited supporters at bus stops, on buses, and other public spaces. Without one boss with whom to negotiate, they figured out ways to influence the white women who hired them. As domestics organized they explored ways in which to engage their employers’ support in the changes they envisioned. In addition, the women tried to expand their organizations as immigrant women moved into care-taking work. As work patterns are changing in the present, Nadasen suggests that other workers may find their situation increasingly like that of domestic servants. Perhaps they can follow some of the tactics developed by workers. Premilla Nadasen is a faculty member at Barnard College, Columbia University, where she teaches history and in the Women’s, Gender, and Sexuality Studies program. Her own personal history has provided a background for writing this book. Her great, great grandparents went from India to South Africa as indentured servants around 1900. When her grandparents came to the United States, her relatives worked as domestic servants. The points she makes are well documented, but her text is easy to read and not full of debates with other scholars. By depending heavily on the stories of household workers about their work and their movement, she brings seldom-heard voices into the historical record. At times her account gets repetitive, however, and I was less interested in the sections of the book that dealt with the specific organizations and legal measures proposed. What I cherished most was her innovative analysis of the women’s organizing methods. I also believe that this analysis is why her book deserves to be widely read and discussed outside as well as inside academia. I think this is an important book and I enthusiastically recommend it to readers interested in activism and/or the relationships of black women and the white women who employ them.